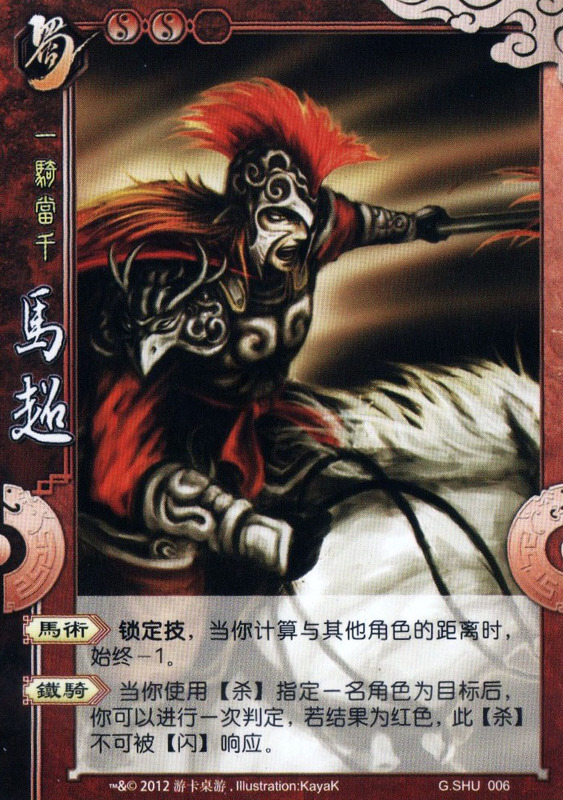 "Lone Horseman that Outmatches a Thousand Troops 一骑当千 (yì qí dāng qiān)"
The valiant general known for his horsemanship and combat ability, Ma Chao is one of Shu Kingdom's 5 greatest generals. Typically depicted riding a horse, he initially led rebellions against Cao Cao 曹操 before eventually finding his place under Liu Bei 刘备. Ma Chao was highly regarded by Zhu Ge Liang 诸葛亮 as an all-rounded civil and military leader. Your distance and range when calculated to other players is always -1. Character ability 2: "Iron Calvary 铁骑 (tiě jì)"
After selecting a player as the target of your ATTACK 杀, you can make a judgement. If the result is red-suited, the target cannot respond to this ATTACK with DODGE 闪. The ability description of “Iron Calvary” has been changed from “cannot be evaded” to “cannot respond with DODGE. His "Horsemanship" ability is a given. Both him and Pang De 庞德 are known for their skilled horsemanship from the moment they appeared in the story. "Iron Calvary", however, is probably just an added skill by the game makers so as to tackle the "dodgy" characters, such as Zhang Jiao 张角, Younger Zhu Ge Liang 卧龙诸葛亮 and Zhen Ji 甄姬. “铁骑” refers to the troops of Ma Chao. Heavy cavalries originated from Liang Province, Ma Chao and his troops could strike hard. Since they were mounted, they could act quickly and their enemies could not ‘evade their attack’.